Well, Gail went and did it again! I really was going to give this months Mind Wide Open challenge a pass due to a very busy schedule. But I just had to sneak over and see what the image was and I ended up staying up into the wee hours last night to do this piece. 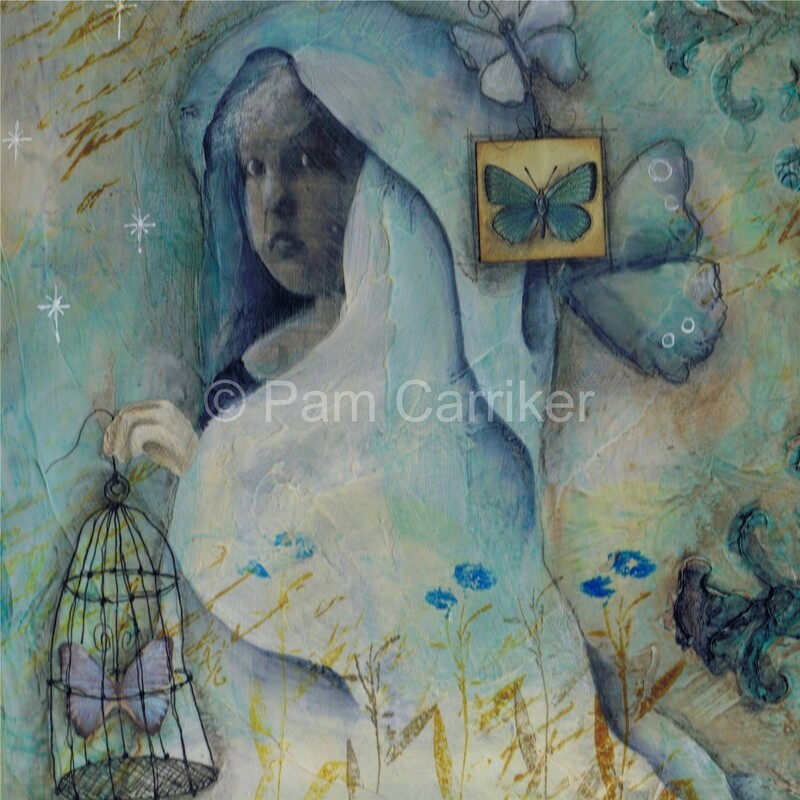 I am calling it ‘Capture The Moment’, which I have represented with the little caged butterfly. The word prompt at MWO is ‘Beginnings’ and I have included the beginnings of wings, sprouting from her back. These represent her first attempts to soar on her own. The beginning of the journey to find her true self. Remember when your child first starts to venture out on their own? It can be frustrating and make you proud, all in the same moment. 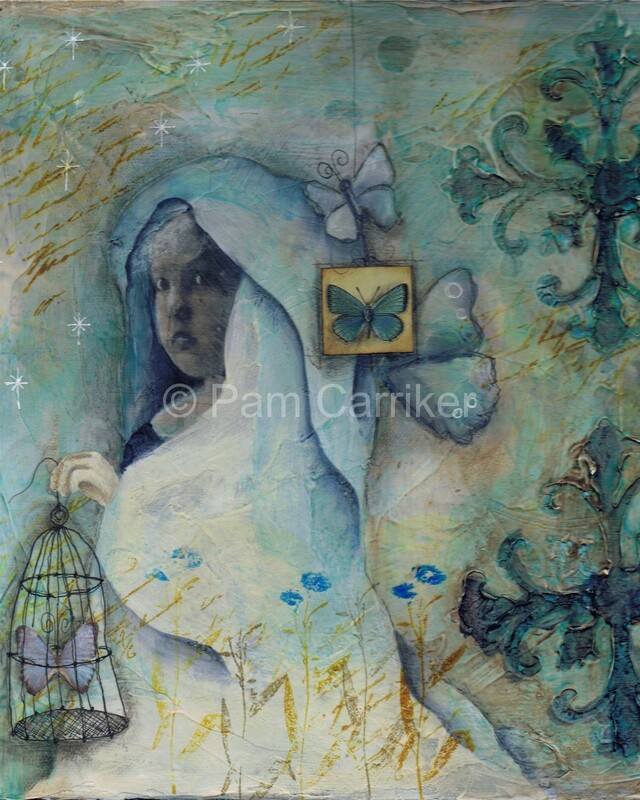 This piece is available in my etsy shop and remember, I am offering free shipping the entire first week in December, on all original works. I enjoy coming to your blog.I am so glad you decided to do MWO thhis month. This piece just feels wonderful! Beautiful! This is just beautiful! Thank you for sharing! Your piece is so dreamy, Pam. Gorgeous. This piece is absolutely gorgeous. It caught my eye and I have greatly enjoyed viewing it. Great Work. Gorgeous artwork. Love the colors! WOW stunning!!! It’s wonderful what you do with this picture. lol…Gail and I were talking about how quiet it will probably be this month at MWO because of the holidays and she said you weren’t going to do one — and then you did!! You are so cute!! And your piece is AMAZING!! Holidays agreed with you — must have been all that sea air!!! ;)And Pam, I’m starting to freak out a little..every time I come here, the “stat counter” about the # of days until Christmas is getting lower and lower…and I’ve done N.O.T.H.I.N.G.!!! Ack!! I am in awe of what you did with the image. I saw it at Gail’s and thought I will pass on a challenge yet again. You have totally transformed the image and made another beautiful piece of art!